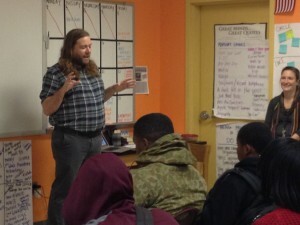 On Friday PhillyMag writer Dan McQuade visited Ms. Melville and Ms. Clark’s 9th grade English classes. The freshmen have been studying journalism in their afternoon literacy seminar, and Mr. McQuade generously volunteered to speak to the students about his work as a writer. First, he presented his own journalism journey, encouraging the students to not give up on their dreams, no matter how difficult the market is. 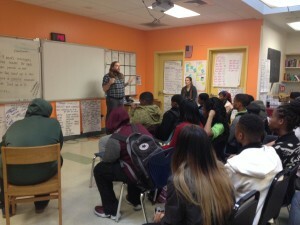 Then, he shared how he produced his piece “How Far Did Rocky Go in His Training Run in ‘Rocky II’?” Finally, he ended his presentation with a Q&A that allowed students to ask him everything about his experience as a writer and his own opinions about some of the pieces they are working on in class. We can’t thank Mr. McQuade enough for such wonderful visit!